DataSunrise provides Heroku Postgres Activity Monitoring tool to keep you aware of all database activity by keeping track of requests targeted to your Heroku Postgres web server. Activity Monitoring reports are needed to comply with regulatory standards in the sphere of information security and to pursue an investigation of a data breach. 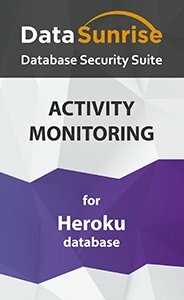 Be aware of the current situation in your Heroku Postgres database with DataSunrise Activity Monitoring tool. The vast majority of cyber crimes is committed by insiders. With Activity Monitoring you always have the opportunity to see the actions of your employees and take measures in case there is someone who constitutes a threat. Activity monitoring is one of the requirements of standards established by regulators and the government legislative bodies, such as GDPR, SOX, PCI DSS, HIPAA. DataSunrise is a helpful tool to retrieve reports necessary for cybercrime investigation. Attack attempts require instant reaction of administrators. Notifications section of Activity Monitoring settings enables adding email addresses to receive notifications in case a certain Activity Monitoring rule is triggered. DataSunrise detects unauthorized access, SQL injection attempts, and other potentially dangerous transactions. Activity Monitoring results can be stored in a database integrated into DataSunrise or in other external databases. Due to the support of the Syslog protocol, Heroku Postgres data monitoring logs can also be exported to SIEM systems, which provides online analysis of security threats.